It's Monday!!! I'm finding my tail is dragging a bit today and I'm pretty sure that I'm not going to be doing any painting today. I spent a wonderful, long weekend with my husband as we celebrated our 21st anniversary. We really enjoyed our time together laughing and sharing and going places and now it's back to work for us both and even though I work from my home some days it's still hard to face the work week, especially when you've had such a lovely weekend. You just don't want that to end, you know? 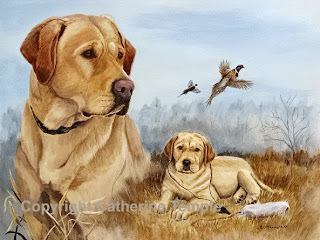 Well, that said, today I am sharing another painting in my Sporting Dog series that I just completed last week. This one features a very handsome Yellow Lab that I'm calling "Past to Present." This painting is also done in acrylic and I am really enjoying the results I'm getting. Having the ability to change things as you go is very appealing and I used that characteristic in this piece a few times. It came in very handy when I needed to adjust color and change how the background looked. I originally had the grass going up much higher, but decided that I was losing the puppy in all that yellow so I just painted it into blue sky. In the other mediums I work in that would not have been possible. I'm thinking that acrylic just may become my medium of choice, but I'm going to keep experimenting before I make that a final decision. This piece is 11 x 14 done on hardboard and is for sale though I have not set a price yet. Note cards and prints are also available. Inquires may come to me at my email address...kindredspirits@clearwire.net. Work on my website updates is moving along nicely and should be ready in a few weeks to publish. I'm hoping to have a page to start selling items directly from my site, things like note cards, prints and even some originals. I'll keep you informed as to when that will happen. In the meantime, I'm just trying to keep painting away to fill my booth for the upcoming April shows I have scheduled. So many things I have going on right now is really keeping me so busy that I'm beginning to think I need a secretary. Think I can find one to work for free??? Everyone have a great week and remember to count your blessings! !